This section contains information related to Windjet, flight code IV, a low-cost carrier regional type. Windjet is based in Italy and has its main base in Palermo and Catania. 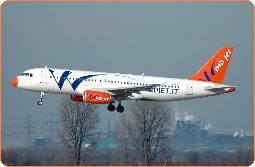 The whole fleet is currently used along domestic flights, connecting Palermo and Catania airports to Rome, Milan, Olbia, Forlì and Venice, as well as in the international routes from Catania, Palermo, Forlì and Venice to Paris, Madrid, Barcelona, Moscow, S. Petersburg, Lille, Bucharest and Oslo. Windjet is fully owned by the Finaria Group. Click to browse to the network development section of this site, featuring more more information on the network development of Windjet.